Meet Elizabeth the First, our noble monarch handsome & towering in her striking regalia, accompanied by either the somewhat overshadowed & henpecked Sir Walter Raleigh or the bowls playing & flustered Sir Francis Drake. 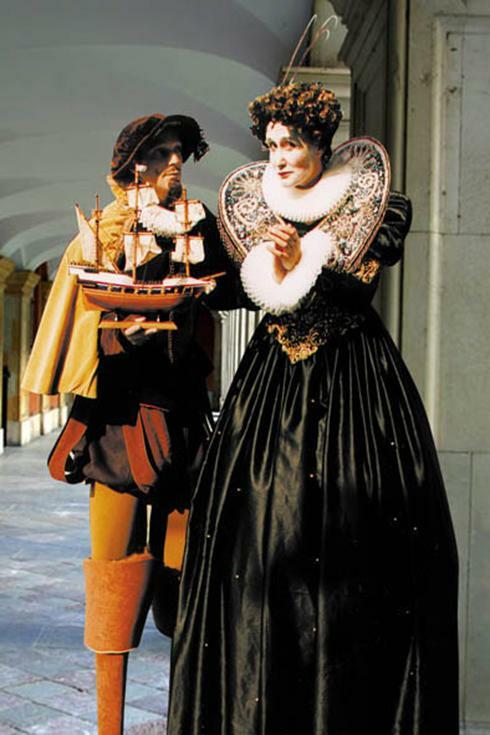 This contrasting comic duo is more Blackadder than RSC, as Elizabeth reigns, Sir Walter, well - he rediscovers the potato and Sir Francis tries to conquers Spain if only he knew where it was. So - may her majesty knight thee… Practice thy best bow, polish up thy curtsey and prepare to lose thy head. A fair even is to be had by all, so let the games begin!